The Sun is a highly important aspect of astrology. The Sun marks our desire to be ourselves and go on whatever path that will define us. The Sun plays an active role in our lives every day. The Sun helps to make us who we are. It helps us to reason and to bring us to the major life decisions that will help us become who we are meant to be. Take whatever the Sun throws at you in a positive way and you should be led onto the path to success and a generally happy life. 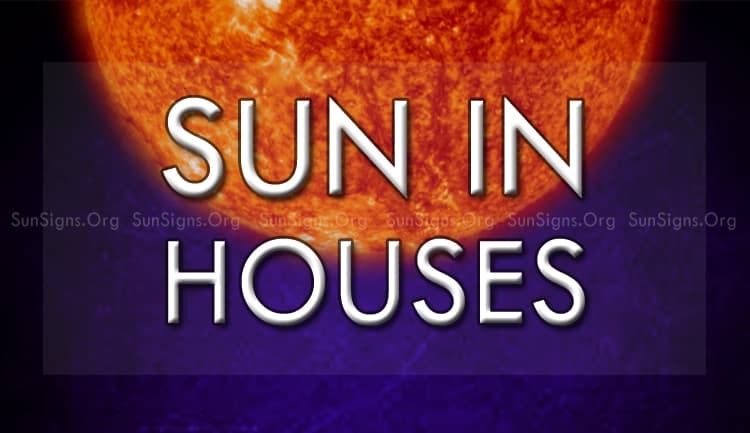 Know the influence of the sun in the 12 houses of your natal chart. When the Sun is in the first house you are likely to be more self-aware on how your actions affect yourself and others. This may make you more self-confident or self-conscious, it all depends on how you take it. Don’t worry about what others think of you. You will feel best when you make a positive change. The Sun in 2nd house of the horoscope will make you more possessive of what you already own. You will start to take better care of yourself and the things that you own. Do not become too materialistic during this time though, as it is still important to take time to be with the people who you care about. The Sun in third house will bring restlessness and the feeling that you just need to do something, anything. Take this time to visit friends that you do not see often. You can also try new puzzles to stimulate your brain. Just stay active! The fourth house brings along a sense of pride for your home and family. Spend time with people you care about, but don’t forget to keep improving yourself along the way. You may feel extra-protective over your family during this time as well. When the Sun is in the fifth house you are likely to want to do whatever you can to express yourself more. This may make you more creative or just generally more energetic. You will be happiest when you are doing an artistic project or playing a sport during this time. The 6th house ruled by Virgo zodiac sign will make you want to be more active in your career or any other activity that you take pride in. You will be the happiest when you are busy doing something important. Find something rewarding to spend your time on. When the Sun is in the seventh house it is a good time to work on relationships. You are likely to make progress with a romantic partner during this time. You will likely try to make new friends, but feel hurt if your attempts are not accepted. Try not to get too upset about this. The eighth house is an astrological house that will make you want to experience the world around you in a deeper sense. When you want to do something you won’t let much stop you from it. Do important things or go on an adventure; you won’t regret it. The ninth house is full of want. You’ll want to know as much as you can when the Sun is in this house. You are likely to daydream of what the future holds and what you can do to get there. Share your new-found knowledge with friends and family, but just be careful not to annoy them with it. When the Sun is in the tenth house you will be filled with a sense of wanting, needing, to accomplish a goal. You won’t feel right when someone tells you how to do something. You’ll want to do things your own way in order to complete your large goals, as well as simple daily tasks. The Sun in 11th house will bring with it a sense of wanting to help others in need. Social situations might make you uncomfortable during this time, as friends or family might try to pull you to a side of an argument. Stick to what you believe in, but try to avoid letting your feelings get in the way of good judgement. Finally, the twelfth house will come with a need to be alone more often in order to organize your way of thinking. You can still help others from the side, but taking direct involvement in something is likely to stress you out. Make sure to make time for yourself.